Usually I prefer theatre to museums because the experience can be so much more emotional. It was not a play but an exhibition, however, that renewed my enthusiasm for making art and not Shakespeare but ABBA that has been in my head all weekend. How did that happen? It turns out that in the countries of Ibsen and Strindberg, they’re pretty good at building musical museums: Rockheim and ABBA: The Museum. Rockheim is the Norwegian national museum of pop and rock music, located in Trondheim. It occupies a colourful box and the renovated warehouse this sits upon and has a small concert venue for live music. The main exhibition is an interactive journey through Norway’s musical history. A lot of space is also dedicated to rooms where you can play instruments, learn about music making, dance and enjoy. Rockheim opened in 2010 and still feels fresh and up-to-date. ABBA: The Museum opened this year in Stockholm on the island Djurgården where you can find many other museum, theme parks and monuments. The museum celebrates ABBA in an interactive joy ride that has you dancing, singing, doing quizzes and taking photos of original artefacts. I’m not an ABBA fan, but this museum is a treat with a consistent level of perfection that is exemplary to museum around the world. Both Rockheim and ABBA: The Museum rely heavily on participation, digital media and the audience taking an active role. In both museums this sometimes works well, sometimes less so. Both at one point however manage to engage even the most observing visitor (in this case, me) and turn the museum into an experience. What are they doing right? 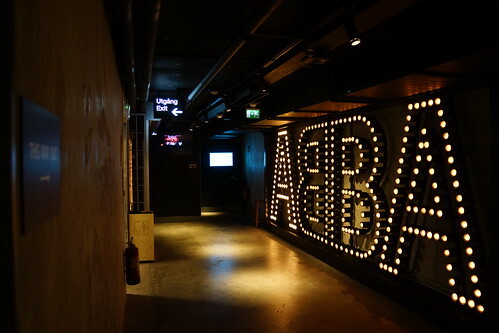 In the ABBA museum you literally only need your dancing shoes and signing voice to participate. Technology does all the other things for you (which usually comes down to putting you next to, on top of or dressing you up like A B B or A.) To record your visit, you use the barcode on your entry ticket. No accounts, no registration, no wristbands. Rockheim mostly uses musical instruments, musical technology (e.g. jukeboxes) and gestures as interactives. In both museums you can be on stage, making music in front of other visitors. According to staff and my experience people don’t often do this (“only tourists”) which is unsurprising in a world where the majority of people are introverts. Fortunately both museum also provide safe spaces for participation in private booths, using headphones or by keeping the impact of participation limited to a small screen. Every time you do something in ABBA: The Museum you score points in a game. You don’t have to play the game, but I saw many people really trying to score as much points as possible. I know very little about ABBA and flunked most of the quizzes and interactives, but still managed to score many thousands of points which made me feel good. Of course, one good question immediately earned me 500-1,000 points, but all the points, ‘well done!’ messages, green letters and other positive encouragements made me feel happy to participate. Both museums use the participation of visitors to enhance the experience for other participants. This is a tightrope to walk as it can create the opposite of safe spaces. Especially ABBA: The Museum does it very subtly, though. For instance, when you look into the studio where ABBA recorded its songs, you will see other visitors singing in the back in small booths where you can do karaoke. In Rockheim the music you hear in some of the exhibits is selected by visitors in the exhibit, making connections between visitors. I visited Rockheim with other museum professionals, which is normally a recipe for chaos (as many of you know). In ABBA: The Museum I was surrounded by ordinary visitors but they felt as comfortable and at home as the professionals at Rockheim. Chatting, making an effort to see certain artefacts, going away from the fixed route and generally enjoying what other people were doing in the museum. It felt really homely. Well done! Above: Interactive and exhibition at Rockheim. Above: A connected piano and interactive at ABBA: The Museum. Music is a rewarding subject for a museum, especially popular music. Both Rockheim and ABBA: The Museum manage to turn the interest and enthusiasm of their visitor for their topic into something more profound: involvement, engagement. It’s tempting (and very Dutch) to look at all the little details that could be better in both museums, but that only distracts from their greater achievement: visitors walk in, and dance out, as ABBA: The Museum promises in its advertisement campaign. Have you been to these museums? What were your experiences?